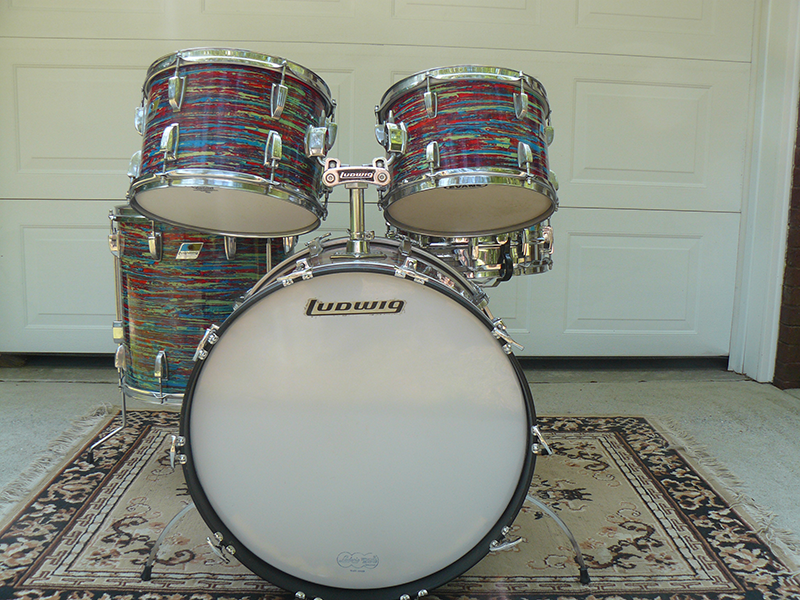 The Ludwig Standard drums were introduced in ’68 to compete with the lower value import drums made overseas. The unique thing about Ludwig Standard drums is that its shell was the exact mold found in all classic shells of that time. Consumers were getting quality grade shells offering the Ludwig signature sound. However, the standard series used less expensive hardware cutting the overhead cost. Standard series drums had most essentials belonging to a drum outfit distinctly unique to this line. Everything from utility hardware, shell hardware, finishes and badges. 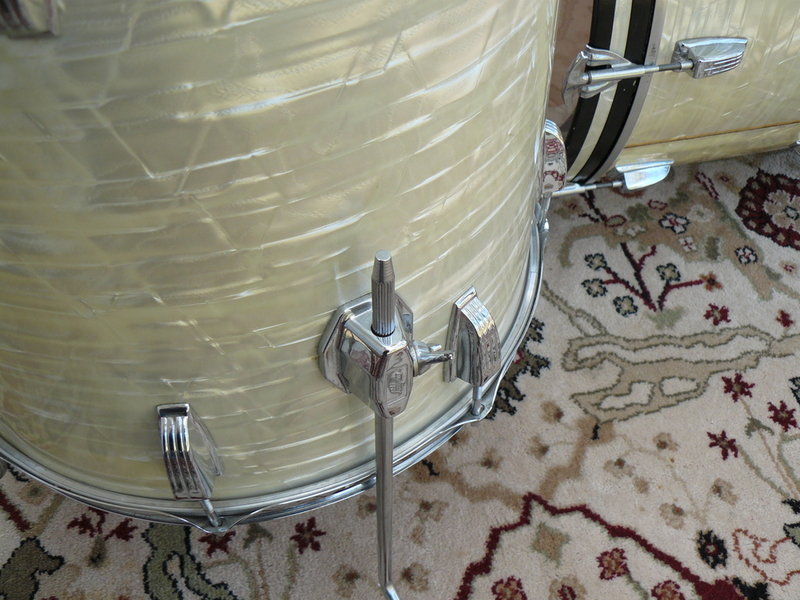 Standard drums were also the first to feature the Granitone sound enhancement coating on the inside of the shell. Standard drums debuted with 3 different configuration styles and 15 finishes. The drum set I am featuring from my collection this month is a Slingerland Modern Jazz Outfit catalog number 9N. The drum sizes are 20X14, 14X14, 12X8, and a 14X5 Sound King chrome over brass 8 lug snare drum with a "Zoomatic" strainer. All drums have "Rim Shot" rims. I always call these rims "Stick Savers", but I saw that they weren't called that in the late 60s catalog. The interiors are coated with the tan or "chocolate milk" paint used in the late 1960s. The Niles, Illinois badges are black and brass ovals with serial numbers. The awesome feature about these drums is the ultra-cool Gold Satin Flame Pearl wrap. I just love the Satin Flame wraps. The wrap looks so good on these drums. I'm always looking for the "pot of gold" and this sweet drum set is just that. The floor tom is the real story with this set. I don't know the history concerning this set first hand, so I am going to put forth a guess as to why the floor tom is a matching Slingerland made Leedy drum. We all know that Bud Slingerland bought Leedy from Conn at the same time William F. Ludwig bought the Ludwig brand from Conn. This was in the mid 1950s. 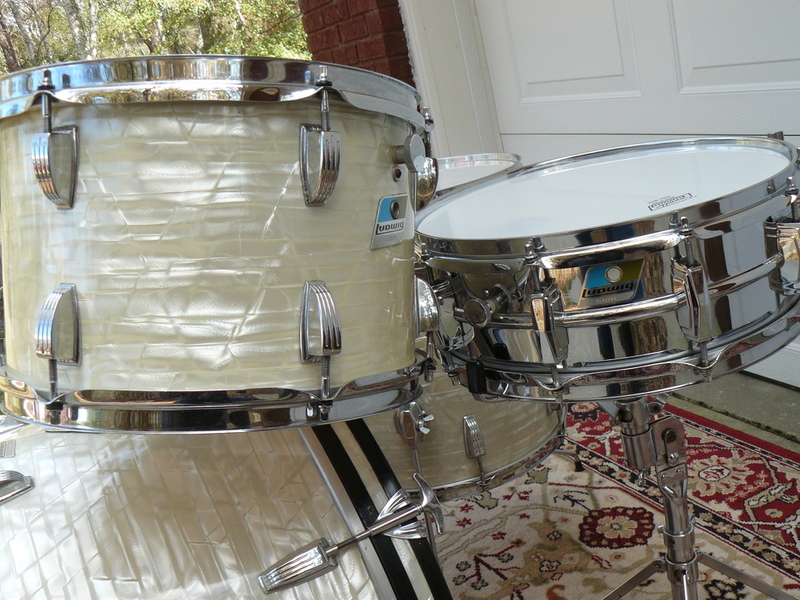 I believe someone had purchased this Leedy and Ludwig set in 1954 as a three piece set. That was not uncommon at all in those days. He later went back to the music store, maybe in 1956 and asked if he could purchase a matching floor tom for his set. 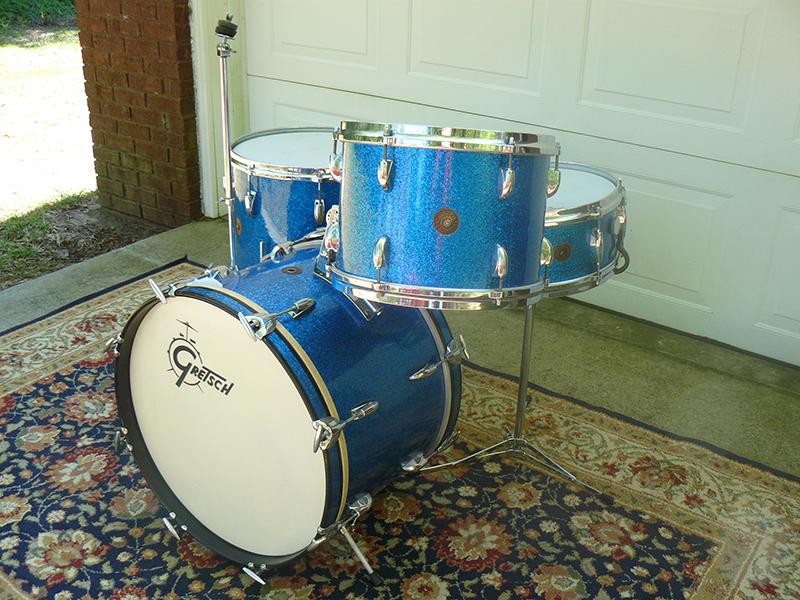 By this time Slingerland was able to fill the order for the store to sell to the customer. Ringo used two Oyster Black Pearl Downbeat sets and two Oyster Black Super Classic sets during his Beatles career. One of the Downbeat sets recently made the news when it was sold at auction for 2.2 million dollars. 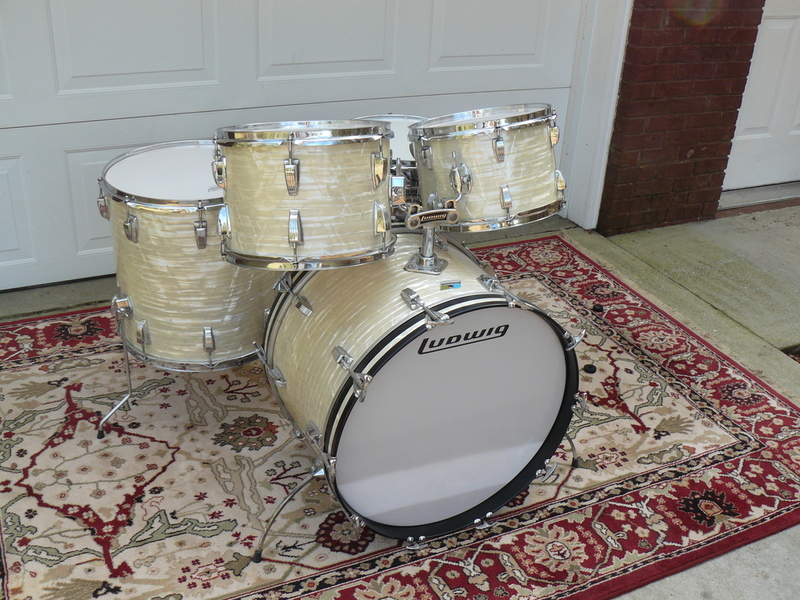 That's a lot of money for a vintage Ludwig drum set. What made it worth so much? Only those who remember what the Beatles and Ringo, in particular, did for the cause of drumming will ever understand. Standards have their own unique triangular shaped badge. The interiors of the bass and toms are coated with grey speckled paint, but some Standards have white painted interiors. Standards usually have smooth low mass lugs. If your Standard kit has Classic lugs that might also be correct. 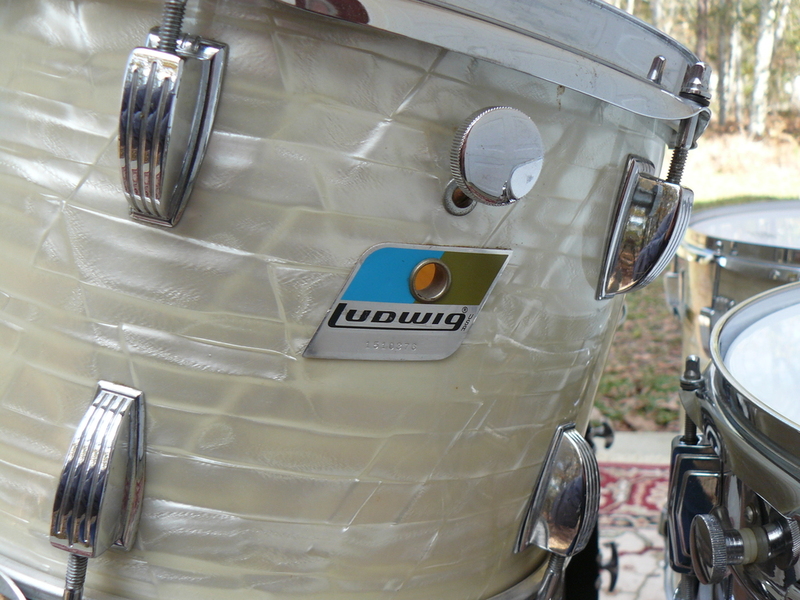 Ludwig would use the Classic lugs if they were low on Standard lugs. Wine Red Ripple was listed as a Rogers wrap from 1960 to 1967. In talking to other collectors I have concluded that these shells were made and wrapped in Ohio and shipped to Fullerton when the plant moved. They were completed and tagged in California and thus became A late blooming Wine Red Ripple set. One thing is for certain, this fine vintage wine will make you high just looking at it. Galaxy Pearl is a very rare finish, as you know, and the prices reflect that when they come up for sale. This finish was only available for a couple of years, so there is a very limited number of these sets out there. The badges on all these drums are pre-serial number Keystones. The 1977 Black Beauties were the first ones Ludwig had made since 1940. 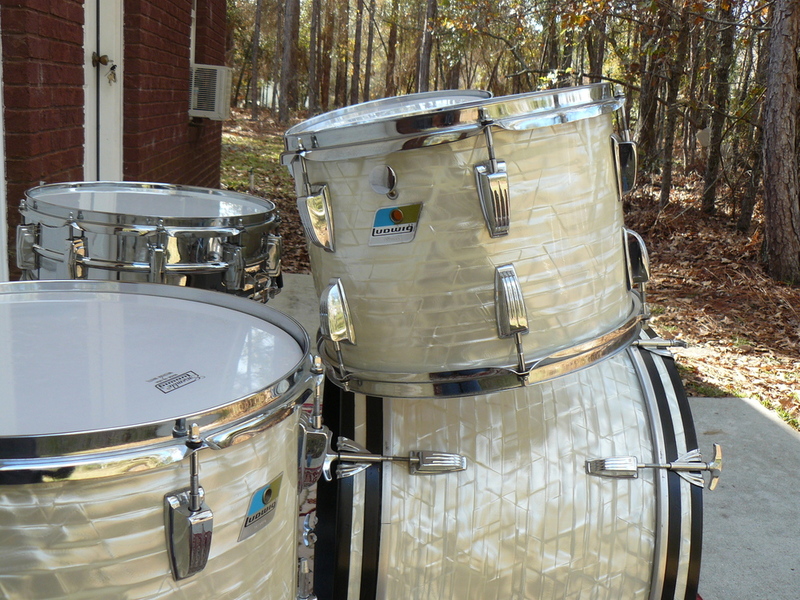 They were offered in 14"X5" and 14"X6.5" with a p-85 throw, and also Ludwig offered these in Super Sensitive model too. The shell was made of a single sheet of brass drawn and spun into a seamless construction. The black chrome plating gave it the striking appearance. These drums were provided with the Blue and Olive badge and an internal muffler. Factory machine engraving was offered in 1979. These 1970s Black Beauties are great collector drums. The drums I have chosen from my collection to show you this month is a cool set of Ludwig Congas.They are not the best sounding congas you will ever hear, but they are definitely the coolest. I have always liked the conical congas like Ricky played on the "I Love Lucy Show". Brush with greatness; I played the Sistine Chapel set on a gig! This past weekend my band shared the stage with another band at a local festival. The drummer for the other band had the drum set I knew as Bobby Rock's "Sistine Chapel" Peavey drum set. I could hardly believe my eyes. "Let it snow, let it snow, let it snow." I really don't wish for snow in the south. We are really not equipped too handle snow. A small snow storm will shut us right down in Georgia. I do like "the white stuff", though. Not the snow but white drums. 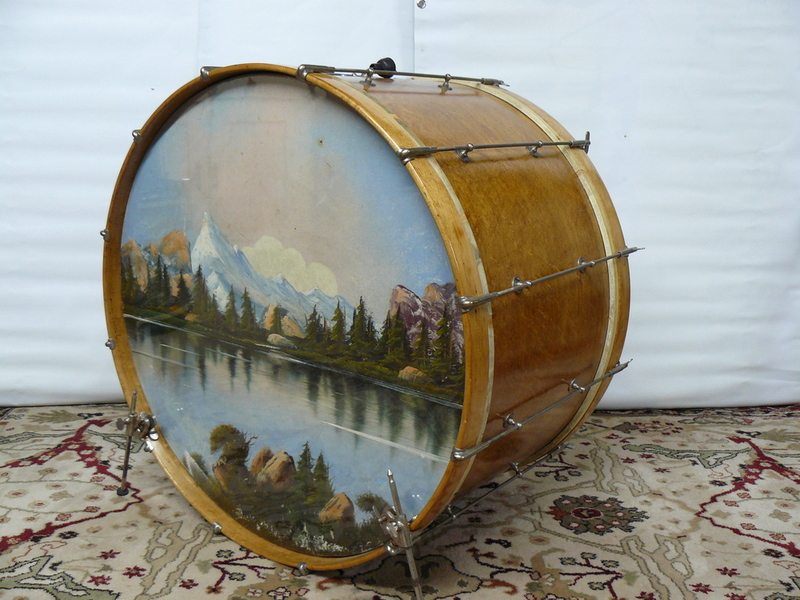 Ludwig & Ludwig 1930s bass drum w painted scene head. .....he wrapped it in cardboard and put a few pounds of tape around it and put it on the Greyhound bus bound for a nearby town that still had a bus station. So the drum rode the Greyhound all the way to Georgia. My latest drum set acquisition is a beautiful Black Diamond Pearl 1960s E.W. Kent kit. Many young drummers received a set of Kent drums for their first set. This set of Ludwigs from my collection is covered in Sparkling Burgundy Pearl. This is one of the rarest sparkle finishes found on vintage drums today. 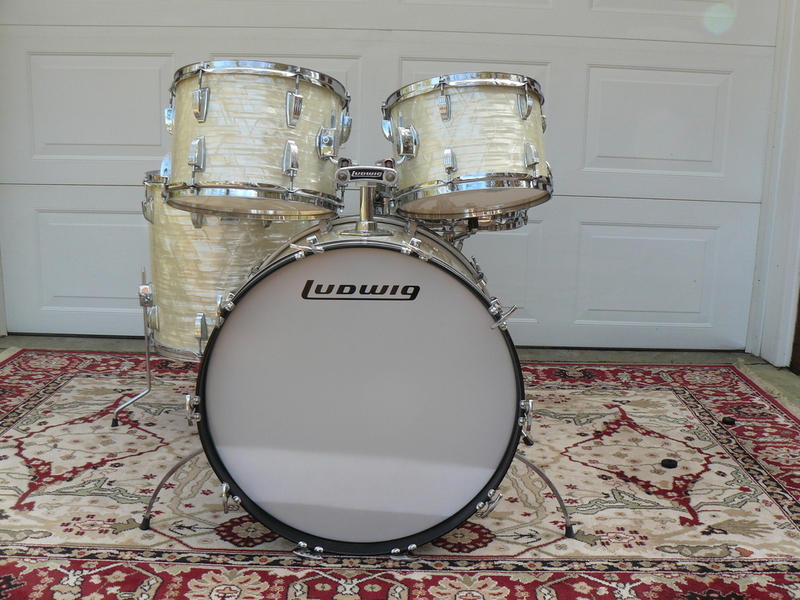 Ludwig introduced this finish in 1967 having cancelled Galaxy Sparkle, the rarest of the Ludwig sparkle finishes. This set I am featuring from my collection is a 1970s blue Big Beat set. The clear and blue colors have been Ludwig's best sellers through the years. I suppose Amber and yellow also sold well thanks to the Bonham influence. It's really warming up for us here in the deep south. I hope your Summer has begun well. I got out early this morning to photograph this drum set for my article and I am still sweating all over the drums as I set them up. I know this set is not mint, but they are a good example of this attractive and desirable finish. I have been writing for the magazine for a while and the reason they keep me around, I guess, is because I am just a regular collector like most of you. I am not a super rich man with unlimited funds to spend on drums. Boy if I were rich I would go wild at the drum shows and keep E-Bay and UPS very happy. Instead, I save for a while and look until I find a kit or snare that really turns me on. I have bought a few pieces every year for the past twenty years, and sold a few pieces now and then. I have sought to improve the collection as I go along. I will buy a set in a finish I like, and when the set in the same finish in better condition comes along, I'll buy it and sell mine. I really don't consider myself a hoarder. I don't have five matching drums in the same finish or anything like that. If I have an extra drum in a finish another collector wants I share up. The set I am featuring this month is a beautiful Ludwig Hollywood set from 1969. 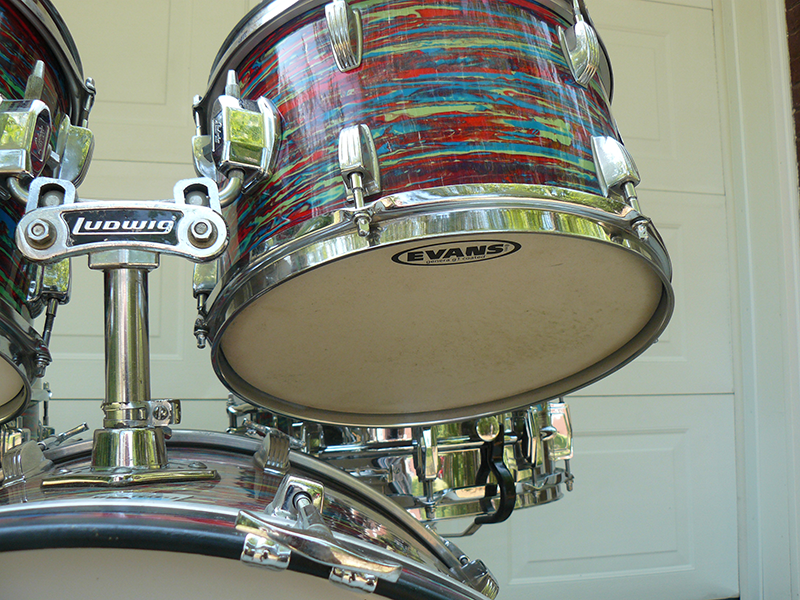 The wrap is Ludwig's exclusive Psychedelic Red Pearl finish. The big drum companies of that day mostly shared the sparkle colors and pearl finishes on their drums, but no other drum company dared to offer this finish, so it was only on the Ludwig sets. Ludwig tried two other psychedelic finishes on their drums, but they were not as successful in sales compared to this awesome finish. I don't have the time nor words to describe what psychedelic means to us who were from the sixties, but suffice it to say we loved everything psychedelic during that period of our lives. The wild colors are a part of that movement, and these drums are very colorful. Someone described this finish as looking like a "frog in a blender." The badges are the Blue Olive parallelograms that replaced the Keystone badges that year. The interiors are natural maple that has been clear coated. The sizes are typical for the Hollywood sets. Bass drum 22"X14", floor tom 16"X16", mounted toms 13"X9", and 12"X8". The snare is a 14"X5" chrome Supraphonic. This was the type snare that went out with most of the sets sold. This was one of the earliest sets I bought when I started my collection. When I was in high school, a friend got a double bass drum set of Ludwigs in this finish. When I saw those brand new Psychedelic red drums I couldn't believe how spectacular they looked. I never got over that, so I went looking to recapture that experience by owning a set like those. I told my good friend Bill Pace, who actually had a vintage drum store at that time, to let me know if he found a set I could buy. He called me one afternoon with the news that he had a set in his store if I wanted to see them. I took my son with me to share the excitement. We bought them and I have certainly enjoyed owning them ever since. They are not perfect, as I said, but if you get a chance to buy a set like this in almost any condition you should do it. The finish fades with time and light exposure. The green color is the first to go. Even faded they are still desirable. 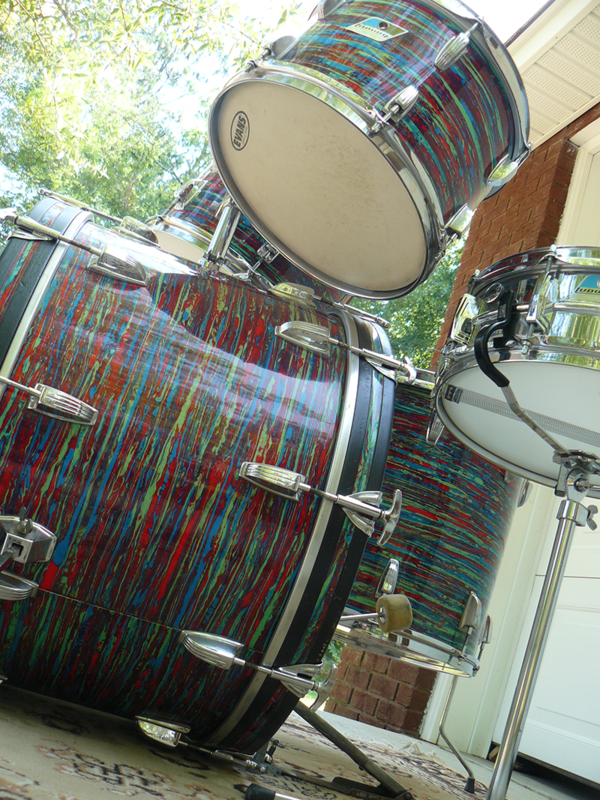 I don't know if this will make the editors cut or not, but I also included a picture of a Ludwig factory Psychedelic wood shell Supraphonic re-issue snare drum Ludwig made for me just before they re-issued the color on sets fifteen years ago. I along with others had requested Ludwig re-issue the finish, and so I got one of if not the first one. The head was signed by Bill Pace who sold me the original kit and by the "Chief" Mr. Bill Ludwig. The Chicago Drum show in May was all I expected it to be. My only problem was I didn't have enough time to really dig in and see everything. My wife and I drove to our son and daughter-in-law's home in Charlotte on Friday. It was hard to sleep Friday night. I was extremely excited about going to the show on Saturday. My son and I started out early Saturday morning with a flight to Chicago. We rented a car and drove out to St. Charles to the fairgrounds where the show is held. I thought I would have plenty of time to see everything and visit with friends. There was so much to see and it was time to catch a plane back to Charlotte before I knew it. If I get to go back next year I will definitely plan to have more time. There were so many people there I wanted to talk to, and if I didn't get to speak to you, I'm sorry. I highly recommend that you go to a vintage drum show if you possibly can. Watch for announcements in the magazine for shows around the country. The drum kit I want to feature this month is a beautiful set built by Drum Workshop. I know you are all familiar with the awesome drums this great drum company is making. The Collector Series is the flagship drums of Drum Workshop. They have the Aristocrat lugs like the ones made popular by George Way and Camco drums. Drum Workshop is built on the foundation of Way and Camco. The Workshop Series line of drums was the company's first attempt at a second line of drums. It was a set that was offered to the working and hobby drummer at a slightly better price, but still very high quality in every way. The most noticeable difference was the oval lugs instead of the round lugs. Another difference not so noticeable was the thin Keller shells without reinforcement rings. These drums sound fantastic. 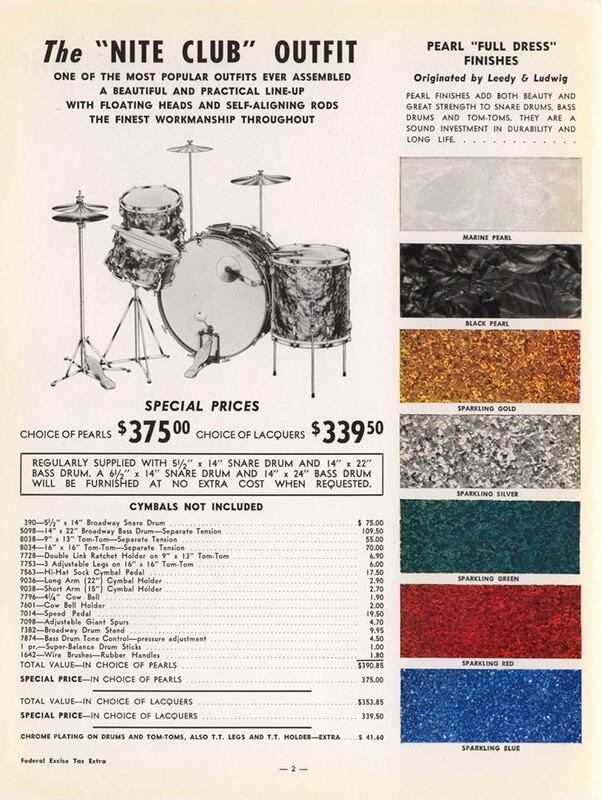 The first Workshop Series drums were limited in colors and sizes. That soon was scrapped because there were special orders for Workshop Series drums in special sizes and wraps. Drum Workshop officially only made the Workshops a couple of years, but continued to make them for special orders for quite some time. The following information was gleaned from a drummer's forum. There was no name given, so I can't give proper credit. The facts are good and answers a lot of questions about these great drums. "My drums are DW Workshop Series, made in the U.S. in 2000. There is much confusion surrounding this somewhat-rare line offered by DW. I have read a lot of messages of people inquiring about DW Workshop series drums with most replies having bits and pieces of truth with some personal opinions thrown in. Lots of readers want to know about their quality and their price range. The Workshop series for the record were indeed 100% DW drums. They were manufactured in the USA (Oxnard), contrary to what some people have been stating. They were never made in Ensenada, Mexico. They were manufactured with what resembles the PDP lug to distinguish them from the Collector series. They were built for only two years. They were made without reinforcement hoops, and were meant to be DW's good, mid-range product. Since they were just as expensive to manufacture as DW's Collector's Series, they were discontinued. Apart from that, they were favored by many DW endorsers in spite of the Collector's series. They were DW's first go at manufacturing an American made "mass produced" set. They didn't offer the custom features like timbre matching and had limited finishes. The finishes were a high-gloss lacquered all-maple shell, or a Satin-Oil all-maple shell. The drums, aside from the different lugs, garnished authentic DW hardware as in the snare strainer. bass drum spurs and tom mounts. Again, 100% DW. DW dropped this line after about 2 years in production because they became too costly to produce, rivaling the production costs of their collector series, but they didn't carry the same retail price tag. So with that, the line was scrapped in favor of the Pacific line. With the technology they gained making the Workshop series, they started to produce the PDP's in Taiwan. Pacific’s were not originally manufactured in Ensenada. DW chose to move the PDP line to Ensenada in the mid 90's to keep the costs down on the shipping tariffs from overseas and to be closer to the factory for quality control. But to state it one more time, the Workshop series was an American manufactured all-maple set. The sound is impeccable and they do not have the reinforcement ring for a broader sound, something DW is now offering (priced) on their Collector series sets. 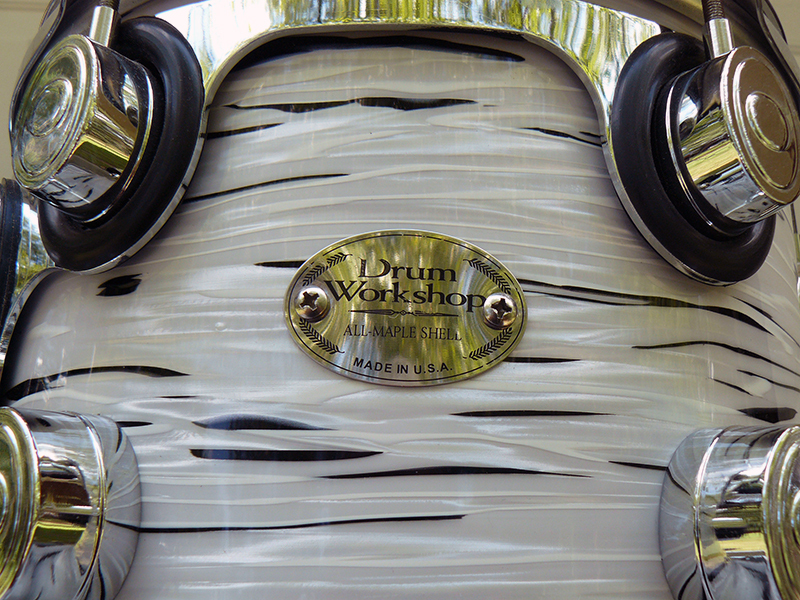 All the Workshop series drums have a DW badge with a serial number stamped on each shell stating "Made in the USA." The Bottom Line Facts: These drums were "Made in the USA", with the same quality maple and parts that go into the Collector's Series drums. The only difference- apart from the differently-shaped lug housings, is that these have no reinforcement hoops. This difference is said to give them more sustain and a more open tone. I completely agree. I didn't buy these because they were less than the Collector Series: they just sounded better, more open, to me." The toms on this kit I am featuring has a 10", 12" and 15" configuration. The bass drum is a thunderous 22"X18". The matching 14"X5" snare is also a very nice touch for this set. This set was obviously a special order and not a standard Workshop Series Kit. The tom sizes and the Ultra White Oyster wrap clearly had to be ordered. If you have a set of Workshop Series drums please comment. I live for your comments. I have some great friends who love, collect, and play vintage drums. It is indeed a pleasure to share this common interest. My editor has put harsh and undue pressure on us to get an article out in time for the Chicago Show. I'm kidding about the harsh and undue part. The editor is really a nice guy, and we all love him and appreciate what he does to get us out a magazine about our passion every month. If you don't think he is doing a great job, you should try to do it. I am hoping I can be at the Chicago Show this year so I can see all my collector friends, and share some time together looking at and hopefully buying some new "toys." Getting to know and keeping in contact with friends who love these old drums is one way to know about good deals for buying, and also it opens up contacts for selling your items when you want to or need to move something. I would much rather sell to a collector friend than ship a great drum off to who knows where. I am not knocking those who sell their drums out of the country, but once that Black Beauty leaves this country it's definitely gone for good. I will get some negative comments about this for sure. 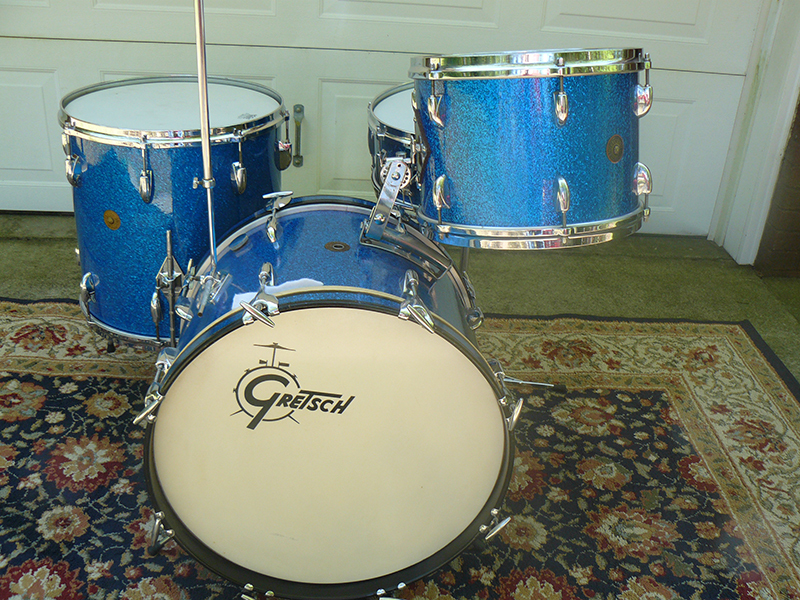 The set I am featuring this month is a 1960s Gretsch Name Band set in blue sparkle. Sometimes I have to tell you why a set is cool, but I don't think I have to tell anybody how cool this kit is. The set is made up of : 20"X14" bass drum, 16"X16" floor tom, 13"X9" ride tom and a very cool 14"X5" matching snare drum. The snare has eight lugs and the Micro-Sensitive strainer. 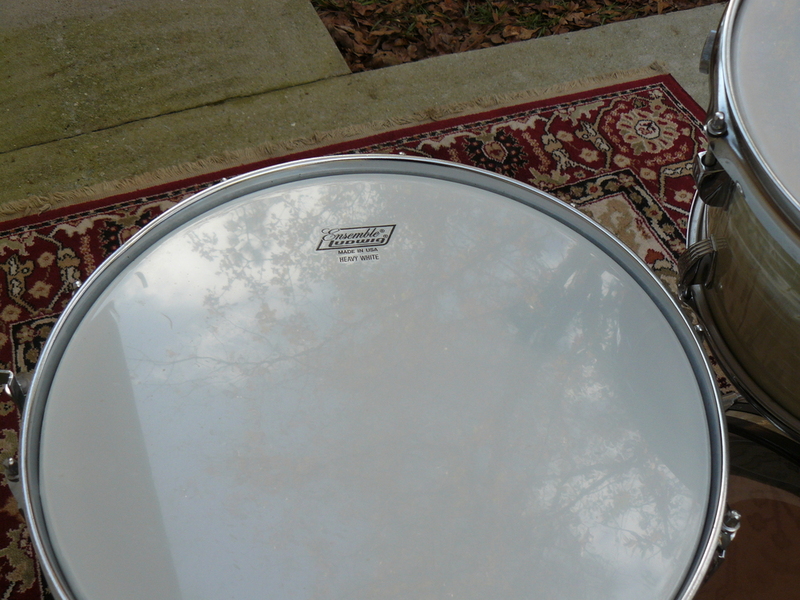 An alternative 22"X14" bass drum was also available in the PX4015 Name Band set 1961-1976. These drums sound great. The shells are six ply with silver sealer inside. 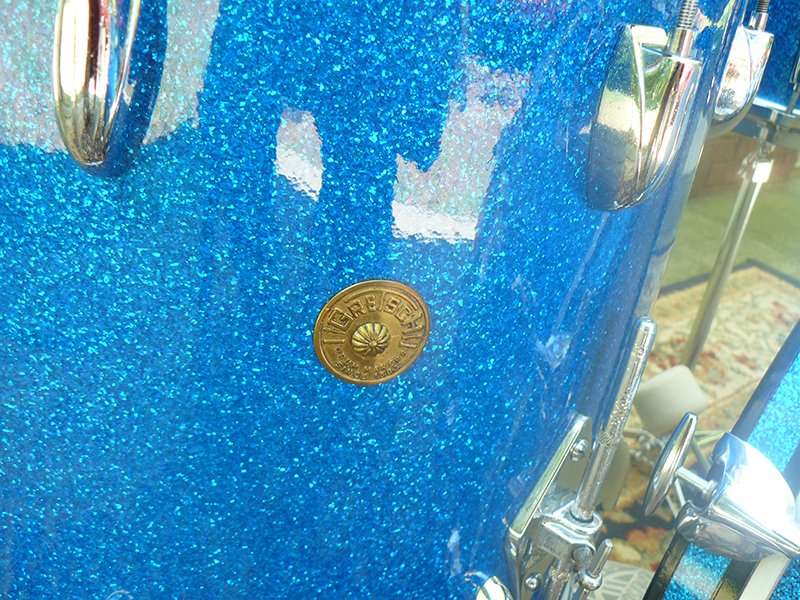 The blue glass glitter finish is still very strong and vibrant on these fifty plus years old drums. It is a joy to own and play an old "round badge" Gretsch drum set from around this era. The die cast hoops and distinctive hardware give them a distinct look. What I would call a timeless classic look. They are truly beautiful. I was saying how great it is to have friends who also share an interest in vintage drums. I bought this drum set from Bill Pace many years ago when I was just starting out collecting. One of my oldest and best "drum friends" is Bill Pace from Forsyth, Georgia. I have been friends with Bill for a long time, and I can truly say with all our drum trading he has always been fair with me. I have tried to do the same with all my drum trading as well. We need to have some ethics and deal with people in accordance with the "golden rule." You know that one, right? "Tell all the issues with the drum to others as you would have them tell all the issues to you." I know you do that already because you don't want a negative feedback. In the old days the only negative feedback was you got a bad name if you didn't deal fairly. Bill is quite a character though. He will work hard to get a good price selling his drums, but he will work even harder to get your drums at a good price. The funny thing about this set I am showing you is it was bought by Bill at a pawn shop. When he bought the set the floor tom I now have with the set was not with them, instead the set had a MIJ 16"X16"" blue sparkle floor tom. It was a Jet model drum. When Bill bargained with the poor owner of the pawn shop he really focussed on the Jet floor tom. He acted so disappointed that the set didn't match etc. etc. etc. The set was sold for a lower price because of Bill's whining. 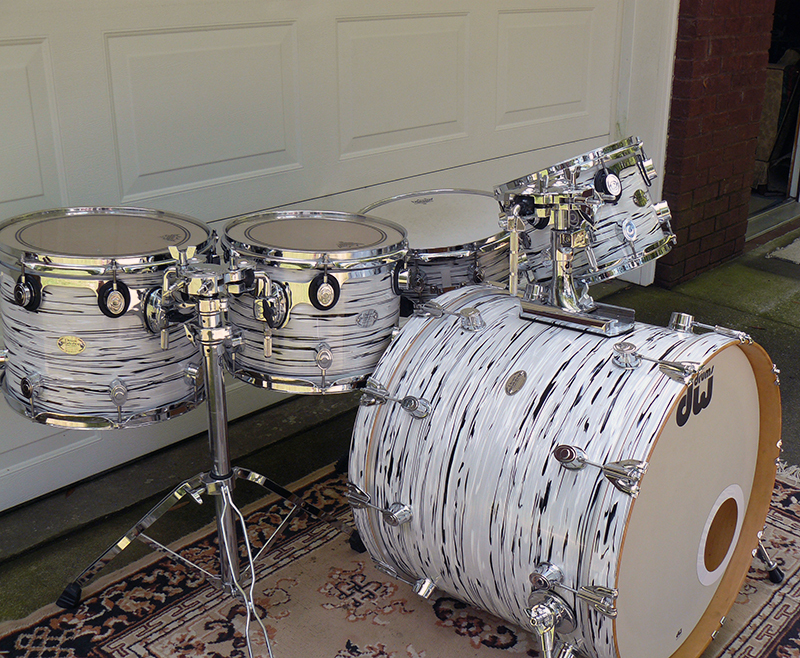 He sold me the set as a "One Nighter Plus" which was listed in the catalog without the floor tom. I later added the floor tom I now have to make the set a "Name Band" outfit.